For most Americans, exposure to different content and ideas on social media has not caused them to change their opinions. 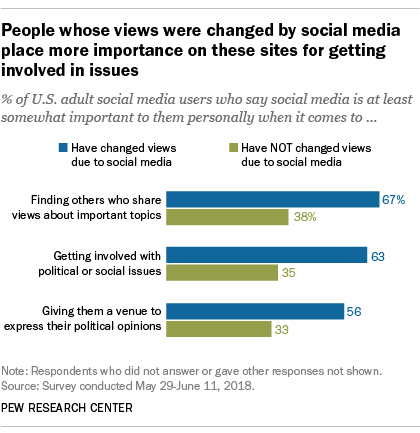 But a small share of the public – 14% – say they have changed their views about a political or social issue in the past year because of something they saw on social media, according to a Pew Research Center survey of U.S. adults conducted May 29-June 11. 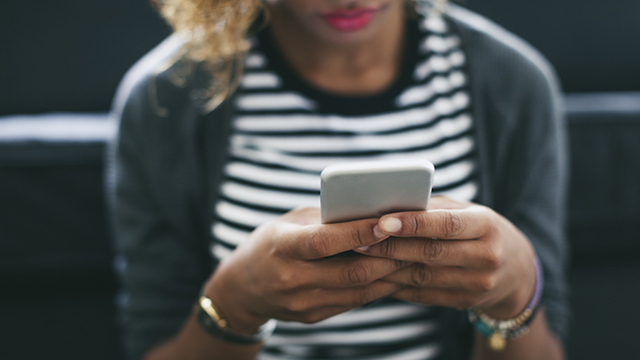 Although it’s unclear what issues people changed their views about, within the past year a variety of social and political issues – from the #MeToo movement to #BlackLivesMatter and #MAGA – have been discussed on social media. Social media prompted views to change more among Democrats and Democratic-leaning independents (17%) than among Republicans and Republican leaners (9%). Within these party groups, there are also some differences by gender, at least among Democrats. Men who are Democrats or lean Democratic (21%) are more likely than their female counterparts (14%) to say they’ve changed their minds. However, equal shares of Republican and Republican-leaning men and women say the same (9% each). Previous survey work with slightly different question wording showed similar overall partisan differences. In 2016, the Center asked social media users whether they had “ever modified” their views about a political or social issue because of something they saw on social media. Two-in-ten said yes and 79% said no, with more Democrats and Democratic leaners than Republicans and Republican leaners saying they had modified views. Although most people have not changed their views on a political or social issue in the past year because of social media, those who have also tend to place a high level of personal importance on social media as a tool for personal political engagement and activism. Among all social media users, people who changed their views on an issue are much more likely than those who didn’t to say such sites are important when it comes to getting involved with political or social issues important to them (63% vs. 35%) or finding others who share their views about important issues (67% vs. 38%). Just over half whose views changed (56%) say social media is personally important in providing a venue to express their political opinions, compared with a third of social media users who have not changed a view in the past year (33%). While Americans who haven’t changed their views put less personal importance in social media, majorities see these platforms as helping give a voice to underrepresented groups; highlighting important issues that might otherwise go unnoticed; or helping hold powerful people accountable for their actions. Those who have changed a view thanks to social media are somewhat more likely to agree that these statements describe social media well. At the same time, majorities in both camps also agree that social media distracts people from issues that are truly important or makes people think they are making a difference when they really aren’t.